It all started when my son’s father lost his dad, David. He lost his battle with lung cancer 6 weeks after being diagnosed. The day they put a port in him, he was given a dose of morphine and I watched his heart meter slowly but so fast go silent. My son Kyle, 16-years-old at the time, was devastated, I had to peel him off of his grandfather, he didn’t want to let him go. My husband couldn’t deal with this. The oxymorphine which hospice carelessly left at the home, made its way into my husbands pocket and into his body causing the numbness of grief to go away. I had no idea that a storm was brewing, I had no idea he was taking them… for years. I finally caught on to the addiction – still so unaware of the monster that it really created – about 2 years ago. When I demanded it to stop, the events that followed are too painful to write. It ultimately led to me moving out of the family home and into a condo. I could not be in the home and witness the deterioration of my husband, it broke my heart. We share two beautiful, smart, kind, well-mannered sons. We couldn’t have asked for better kids. After I moved out, Kyle couldn’t deal with his father anymore either. His father tried to get him to move in with me, but Kyle was determined to be on his own. He was 20 years old and all I could do was support his decisions. I, of course, took groceries and his laundry and cleaned his place up often. I never saw the first sign of anything going on with my son. He wasn’t innocent, I found plenty of evidence of marijuana. I didn’t – how could I? Kyle had a real peek into the cold-hearted world and it broke his heart. The pill problem seemed to be escalating with my husband and my focus was on him. I just wanted all of it to stop, I wanted my family back. I wanted my family back so bad, I cried every night. All I could do was pray and do what I could I do for Kyle. In the meantime, Gavin, our younger son, had given us no trouble at all so I was focused on Kyle. Kyle was given pure fentanyl and it took his life! My husband, of course, was handing this loss a whole lot better than I was as I was not numb, I felt every ache you can imagine and some you never want to imagine. I was angry at him, so angry… it got me nowhere. For Kyle, Gavin and me, as well as for himself my husband has been clean for 60 days today, I am proud of him, so proud! I researched and I asked professionals, addicts, etc. and the addiction is real, it’s so real. It’s so hard for addicts to quit opiates, even with will power. My husband is currently in a terrible state of grief, as we all are, but it’s just really sinking in both of his losses, it’s heartbreaking! There’s hope but the price we had to pay to gain hope of recovery was way to costly considering what we lost. We lost something so precious and so meaningful, so irreplaceable, we lost our son. If my husband did not stop I would probably of lost him, too. The pill epidemic is terrible, it’s ripping families apart and leaving them with broken hearts and souls. There is hope of recovery, I pray to God every night for people dealing with their loved one’s addiction, it’s so hard to watch, however, you can have one right under your nose and not even be aware of it. It’s tragic. So to all who worry about if your child is coming back home because you know when they leave they are going to use – my heart simply breaks for you. I pray for you. I pray it doesn’t take a loss for them to get to the point of wanting help! My name is Jené McLaughlin, I’m 40 years old, currently write for a local magazine, have two sons, Kyle & Gavin. Kyle is my angel, who is forever 20. Gavin is 18, graduates from High School in 2019 and starts his internship with Lockheed this spring, 2019. I am currently struggling with complicated grief and anxiety, I am constantly trying to find a way to cope and writing has been my best release, I have found thus far. Thank you for reading my story. Guest Post by Jené McLaughlin, as part of the series ‘Share Your Story’. Find out here how you can share your story. His brother was six. He had been asking for a sibling for more years than I could count. That year, I finally got to tell him I was pregnant. On New Year’s Eve, we had made a joke about no siblings that year and he had wept. He didn’t yet fully realize the year would be over in four hours. I was under terrible stress. Medical examinations all the time, no answers, and I didn’t even realize I had no period when I should have. Then, out of a joke to my husband, I counted back and it came to me. I had an important delay. That pregnancy was like a wonderful dream come true. Unlike his brother, he wasn’t born preterm. I was overdue! My labour was amazing. Wonderful. Painless. I’ve always taken that as a gift for me. A goodbye present, maybe? Then, after a whole wonderful day labouring, I lay down for the doctors to check on the progress. His heartbeats went crazy, c-section, and I entered this world. The world in which a wonderful day discloses into an endless night. A world in which a six-year-old will be told his long wished sibling won’t go home to play with him. A world in which people stop you on the street to ask about the birth and get what happened with a glance. A world in which people insist on saying you have only one child, though you gave birth to two. A world in which you have no heart to get into your house while the baby stroller is there, ready for a baby who won’t ever use it. And I’ve coped with so many comments. Comments from people who never got near this world. Comments from people who never knew such a world could exist. And to this day, after five years, I still talk about him. He will always be my precious second born. There are people who don’t want to hear about him. People who take it as a personal offence to the world (they live in) if I publish his photo on my social profile. People who get their maths wrong with how many kids I have. But there are also people who watch this world with due respect. People who say his name with no fear. People who don’t take it as a contagious disease if I speak about him. He lives through me, my every breath, my every heartbeat. He lives through my words and my thoughts. He lives through his brother who is now eleven. He lives through his sister, born exactly three years after he was born. He lives through my laughter and my tears. And he always will. Guest Post by Ivone Soares, as part of the series ‘Share Your Story’. May We All Heal starts tomorrow! I’m so honoured to host the 4th MWAH creative (and FREE!) healing event in the name of the Grieving Parents Support Network. May We All Heal – what is it? If you’re new, you might like to read the detailed information about MWAH on the event page and the information specific to this year. 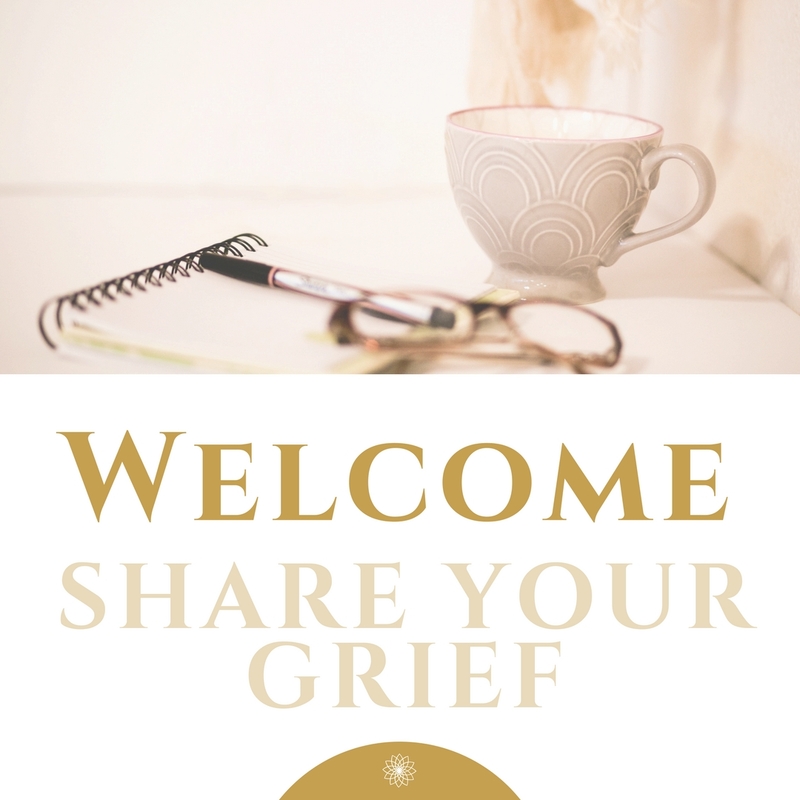 Our theme this year is ‘Share Your Grief’ because I believe it is so important both for your own grieving and healing, as well as for the people surrounding us, to hear YOUR grief story. Through the prompts, we will be able to highlight different angles and perspectives. Sharing – yes or not? Sharing yourself, to most of us, is a vital part. Child loss is a very isolating experience, both through the emotional intensity, the taboo of the topic and the misguided myths circulating in society. 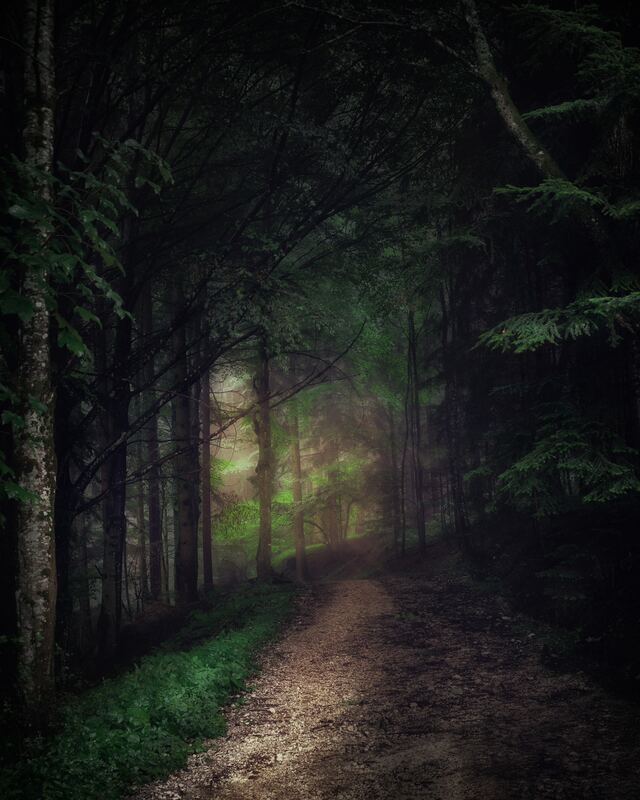 Those often leave the bereaved confronted with unreasonable expectations (in themselves or from others) of what healing means and in what time frame it should be completed. 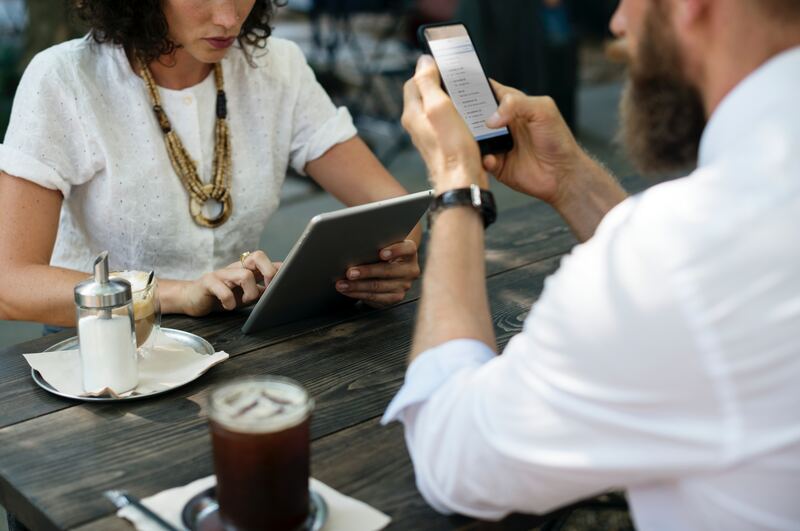 Whether you choose to partake on your own, with your own private notebook or whether you’d like to share yourself with a wider audience is your personal decision. We just know from participants testimonials that the aspect of community that resulted from sharing, commenting and conversing with others played a huge role in their healing. If you decide to share, you might like to share this notice to family and friends, so they know what to expect and why. Add your personal words and let them know how they can best support you during the MWAH project month. Click on the image to see a bigger version and then save it to your device. There are two main avenues which you can choose to share: Instagram (IG) or Facebook (FB). 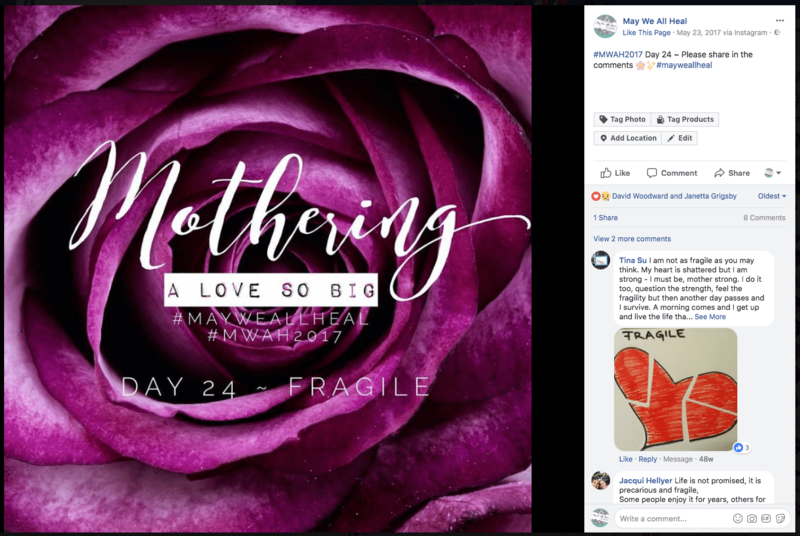 If you know how to use IG, simply add the hashtags #mayweallheal and #MWAH2018 and make sure to follow @mayweallheal (event profile, mainly used during the event) and @mymissbliss (Nathalie’s and Grieving Parents Support Network’s profile, used all year around). Also, if you normally have your IG profile set on private, consider making it public, at least for the duration of MWAH. It just easier for people to see what you’re sharing and comment. You’ll learn IG by doing it, it is really very intuitive. I’m going to assume that you’re on FB and know how to use it. We will use the May We All Heal group to share because it’s a private and closed group. This means that only members can see and read your posts. So, if for whatever you prefer your friends on FB not to be able to see what you share, this is the place to share. You can however not directly post there from IG. In order for this to work, we need to create some structure on how you all share on the group page. In the image, you can see an example from last year’s event. We will post a daily lead image with the prompts in the May We All Heal group. IMPORTANT: Please ONLY post your images and words underneath that daily lead images. This way, all the contributions to a specific prompt are together in one place and not scattered over the newsfeed of the group. Individual posts get lost, clog up the feed and due to that fact will be deleted. We will be starting with our FREE annual event ‘May We All Heal 2018‘ in just 6 days. If you want to share your images, thoughts, stories… please do so in our May We All Heal peer support group on FB. Please follow @mayweallheal and @mymissbliss on Instagram to receive updates on the event. If you like other participants to follow you, leave you IG handle (@…) in the comments below. I’m honoured to be your host. 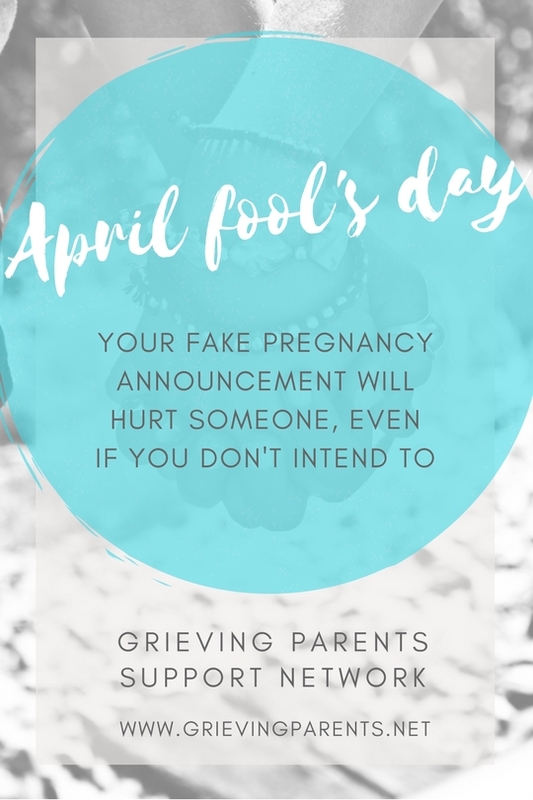 Triggers can come in all shapes and forms – for example through a joke, like a fake pregnancy announcement on April Fool’s day. Remember, those sending them out on social media surely are not doing it with the intent to harm, but to pull someone’s leg. They usually don’t think that far as to who they might be offending. If this is your expectation, it will set you up for disappointment. The truth is: they don’t just know. Empathy is easy when you’ve experienced something but it’s not everyone’s strong suit when they haven’t experienced the death of their child. Did you always react with empathy and sensitiveness before you became a bereaved parent? I guess most of us were just as oblivious as those we are expecting to know better now. Here is where you can step into action: Let your friends and family know what might upset you and why, for example by sharing an image you can find on pages supporting bereaved parents. We’ve got ours here for you and you’re welcome to share it. PS. And it’s not just bereaved parents that might be hurt, so we kept it non-specific. If you are grieving after losing a loved long ago, does it hurt any less? Do you miss them any less? Probably not. My maternal grandmother died in the early 80s. I had a miscarriage in the early 90s. I still remember both losses as if they were yesterday. Even though time has softened my grief, it has not healed these wounds. These losses are a part of me and always will be. Giving grief more time certainly won’t change how I feel about my grandmother or my miscarriage. Give yourself the space you need to grieve without any time limits. Understand it will take as long as it takes. Your grief may soften over time but the loss will always be a part of you. As the oldest of two girls, I heard this statement throughout my entire life, “You have to be strong for your sister.” I took this literally by walling off my heart at a very young age. I thought if I didn’t feel or show my emotions I was setting a good example for a sister. Not expressing my sadness only hurt me in the long run. After my divorce, my children chose to live with my ex-husband because I was the “stronger” one. They thought I was “better” at being alone than he was. This was the furthest thing from the truth. Being strong set the wrong example and brought me heartache. Be human. Express both happy and sad emotions. It is healthier for you emotionally, physically and spiritually. It also sets a better example for those around you. Your sadness gives them “permission” to also be sad. Society has taught us not to burden others with our grief. I felt that way after the suicides of my two friends. I didn’t want to bother anyone with my sadness so I stayed to myself. Family and friends have their own problems. The last thing they need is my sadness creeping up on them. Grieve alone so you can stay out of the spotlight. This is not healthy. 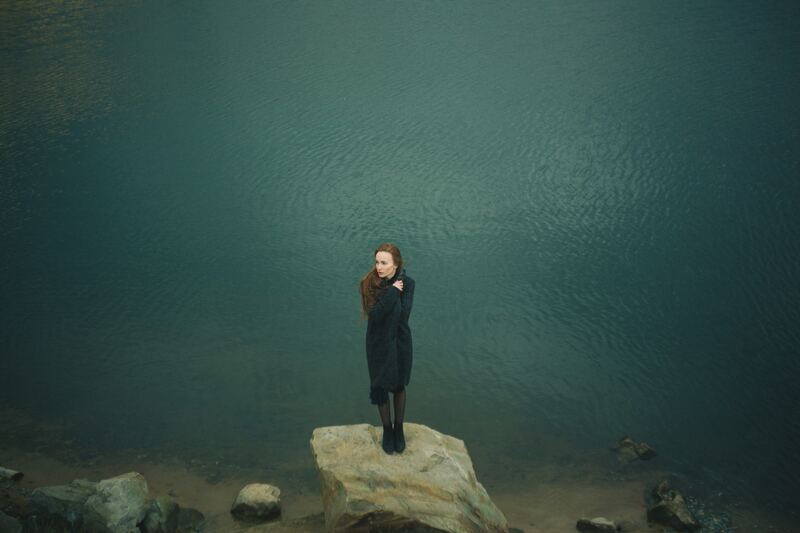 Take time for yourself, but not to the point of isolation. Find a healthy balance between being alone and spending time with friends or family. Choose family members and friends who will support your grieving choices and listen without judgement or criticism. As babies, we were free to express our emotions. We laughed when we were happy, and cried when we were sad. Our emotions changed at the drop of a hat. This was expected behavior. But at some point in our childhood, an invisible switch was flipped and we were told it was no longer “acceptable” to express our sadness. I am not sure exactly when this happened, but it was probably when I was in elementary school. My parents started saying, “Go to your room if you are going to cry.” This lead me to believe that sadness was a bad thing and must be avoided at all costs. So, I pushed my emotions down. Way down. I built the wall higher around my heart. Not the right approach if you want to be “healthy” and have healthy relationships. Be honest about your emotions. Express your sadness rather than avoid it. Sadness makes you human. It’s what ultimately gets you through your grief. Were you ever told after a relationship break-up “Don’t feel bad, there are plenty of fish in the sea”? If so, did it help you to feel any better? You may have felt worse because it implied you should never grieve over the loss of a relationship. It also implied that moving on right away would help you to feel better. But does serial relationships ever help you to feel better? I would argue they don’t and most people probably feel even worse. By not grieving we carry the same emotional issues from one relationship to the next. It is often a contributing factor to why there are so many break ups and divorces today. Grieve for your relationship before moving on to the next. Be sad for the future that is never going to happen. Forgive your former partner and yourself. Decide what you can do better or differently the next time around. This way you move forward in a healthy way and don’t carry any unresolved emotions with you. Speaking from experience I can say I became a workaholic after the suicides of my two friends. I thought if I kept busy enough, my grief would go away. But it never did. It just got buried. Consequently, it churned and churned until I felt like I was going to explode. I became exhausted emotionally, physically and spiritually. Keeping busy is just an avoidance technique and can be one of the worst ways to handle grief. Take the time you need to face your grief. Schedule extra time off work when needed. Practice self-care. Be gentle with yourself. Replacing these myths with healthier ways to grieve helps you to better navigate the ups and downs of your grief journey. It helps you to leave that mythical land of grief once and for all. Sharon Ehlers is the founding member of Grief Reiki® LCC. She is an Advanced Grief Recovery Method Specialist® with the Grief Recovery Institute®, and a Reiki Master Teacher. Sharon is the author of Grief Reiki®- An Integrated Approach to the Emotional, Physical and Spiritual Components of Grief and Loss. She is a co-author of Grief Diaries: Surviving Loss by Suicide which was a three-time finalist in the National Indie Excellence Awards, Book Excellence Awards and Best Book Awards. Find out more about Sharon Ehlers on her website. Find out more about the Grief Recovery Method here: www.griefrecoverymethod.com. Mother’s Day is celebrated in many countries around the world on different days throughout the year. Most countries – the number comes up to 128 – celebrate it in May, followed by the month of March with 48 countries. Check out here when Mother’s Day is in your country. Mother’s Day is likely to be full of triggers for bereaved mothers. Let’s see why and how we can handle them. We are forced by commercials to look at Mother’s Day and somehow include it in our lives if we want to or not. If you’re part of a culture that celebrates this day, there is no chance to run away from it. We need to be prepared for this inevitable fact. Think about how you deal with it that is best for you with how you currently feel about your loss. All of us are daughters and sons. If Mother’s Day was part of our family’s celebration, we have some kind of predisposed expectations on what this day should look and feel like. We need to find out what Mother’s Day means to us personally. This is not your Mother’s Mother’s Day, this is YOUR Mother’s Day. Find out what it is that YOU need right now. Your personal situation will greatly shape your experience. Are you going into this year’s Mother’s Day with a partner or as a single parent? Do you have other children? Or would it be your very first Mother’s Day if your baby had not died? Do you have expectations of your family of origin to deal with, expectations of your own mother? Do you feel like you want to celebrate it because you feel like showing yourself and others that you are a mother despite of your baby’s death? Or do you feel like not celebrating because it hurts you so much to have to spend this special day without your beloved child? Find out what fits best for you on this day! Plan, at the same time, make space for the unexpected to happen. If you need to attend to a family gathering that might be challenging, plan an exit strategy. Include your family/your partner or even your best friend in your thoughts and feelings about this day. If you have living children, they might have some ideas on how to memorialize their sibling and celebrate you as their mother. Create your personal day together with them or on your own, depending on what you need. Think about this: Do you want to be alone or with family or friends? If you have company, you don’t need to spend the day alone and there will be always someone to hold you when you have a tough moment. Plan the day for yourself with the decisions you made on the questions above. Sit down and create this day for yourself. Be active and take responsibility for making this Mother’s Day a day that suits you. And Yes, you might cry on this day and there might be times of grief on this day. But that is ok and has its place. 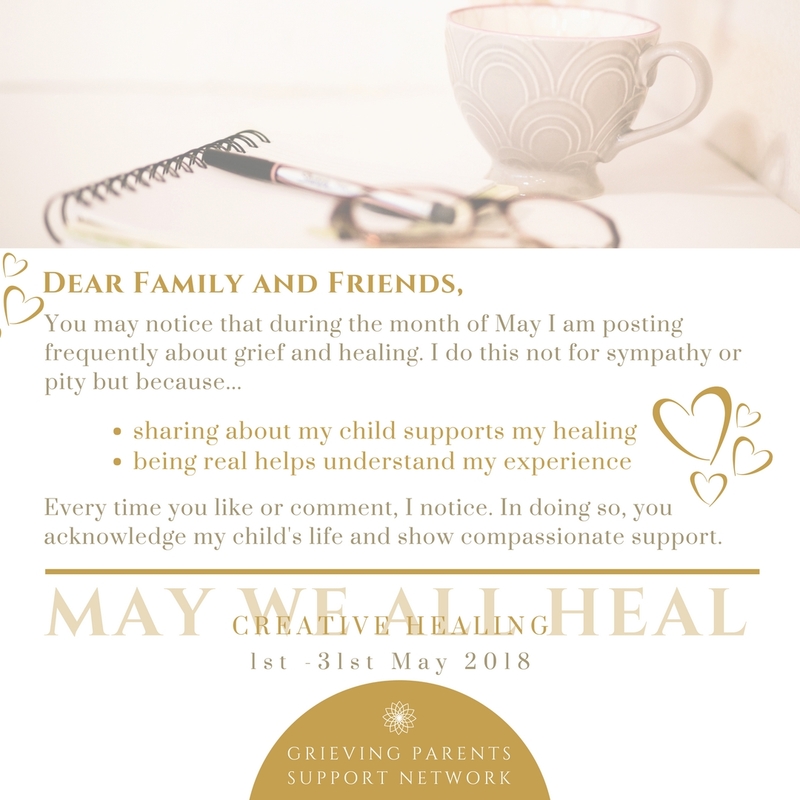 Please share your thoughts and questions in the comments or follow the discussion in the May We All Heal peer support group here on Facebook. For the fourth year in a row, we are joining together to make space in our heart and lives to nurture our healing. Join us! If you have never taken part, you might like to watch the video, explaining the event on the MWAH FB page. If you prefer reading about it, you can find all the information under events here. In the coming weeks, I will talk to several members of the Grieving Parents Support Network community about their experiences in the past year. If you’re interested to find out more, make sure to ‘LIKE’ the page and under ‘following’ choose ‘see first’. 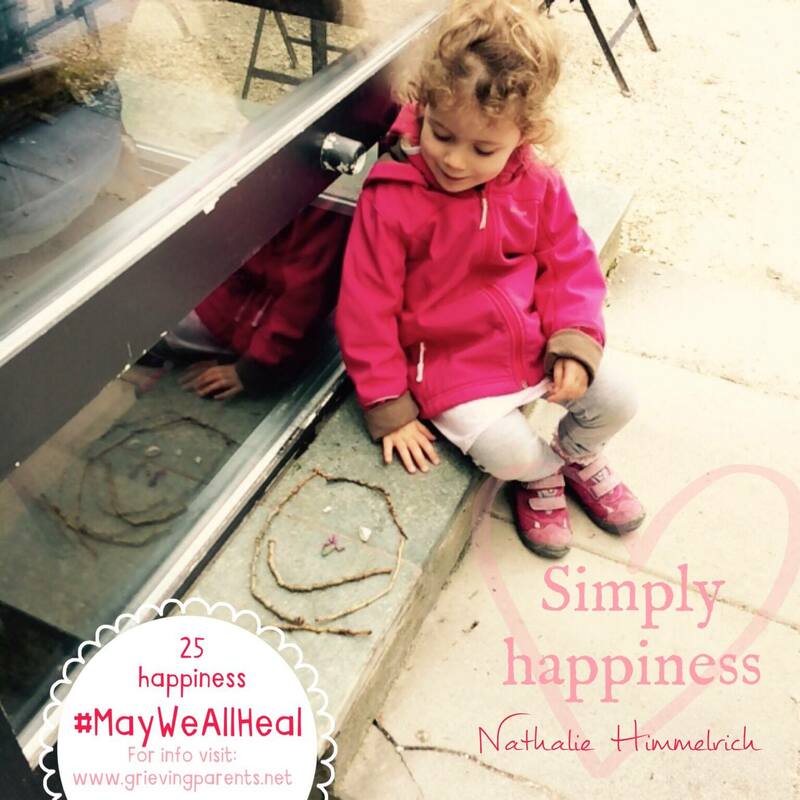 Alternatively, you can follow @mayweallheal on Instagram. New Year – Welcome on the other side. Take a breath. You survived the holidays. As much as I love part of the holiday spirit and the coming of a New Year, I often encounter myself in a quiet, unsociable mood and end up spending – at least some part of it – by myself. This is how I re-energise and re-calibrate for whatever newness might come with the New Year. How about you? How do you manage to cope in those days? Looking back I’ve already started much better: this time last year I was heading to the hospital with pneumonia. Personally, last year was a really challenging year for me health wise and it seems it can only get better. 1. What have you learnt about yourself and grief/grieving? 3. What are you ready to let go? 4. How do you want to be with your grief in 2018? What do you want to bring forward into this New Year? Setting an intention can be powerful. Author Lynn McTaggart* has found that for something to occur it is 300.000 times more likely when one has set an intention. See them not as hard and fast rules or goals like those you would set in your business, but rather guiding principle to strive by, to remind yourself regularly that you’re ok the way you are. sit with the pain without moving to hide it, fade it or fix it. at the same time as finding and experiencing joy without feeling guilty. and look after myself in whatever way needed. and integrating not just the memory, but my ever unfolding experience into my life. With that, I wish you a blessed, gentle and healthy ✨ New Year – May you be exactly where you need to be in 2018. With Thanksgiving upon us and Christmas just around the corner many bereaved parents cringe at the expectations of their surroundings to be happy, grateful and merry. Statements like „but there is so much to be grateful for“ or „focus on the living, not the dead“ has some of us want to go into hiding with our hands over our ears singing „Ladadee-ladadaa“ on repeat. Those seemingly true (cognitive) statements are emotionally barren. They are just emphasizing the opposite of what they are intending: further hurt and leaving the bereaved feeling completely misunderstood and lonely. Family gatherings, which often turn out to be more stressful than happy, can accentuate those empty chairs at the table. Without intending to, those unaffected seem to be completely unaware of those deeply missed. They also often overlook the struggles the bereaved are going through to keep their facade matching the festivities. That’s where we need more empathy and foresight in being together. From both sides. Opposite states can live side by side, even if that seems paradoxical. In my case, raising a twinless twin I’m grateful for what I have and equally grieving for what is not my so desired reality: raising two girls. The crux is that what often is seen as expected – and we are often expecting of ourselves the same – is the impossible: just feel grateful! But the missing cannot be suspended, the grieving isn’t on a timer to be turned on and off on demand. I believe it starts with self-acceptance which goes hand in hand with self-care. I accept my ups and down. I take care of myself to make sure I’m not overextending myself and my energy. I don’t always succeed but I try. Self-care includes telling others where my boundaries are, whether they understand or not. And sometimes it means disappointing someone else to be true to yourself.